What about the limes? As long as you can keep it frost free they should keep going over winter. The lime tree is in a real state in the garden… the pot is so heavy that I’m only prepared to move it once, so its entry into the eponymous room will have to wait until next week! 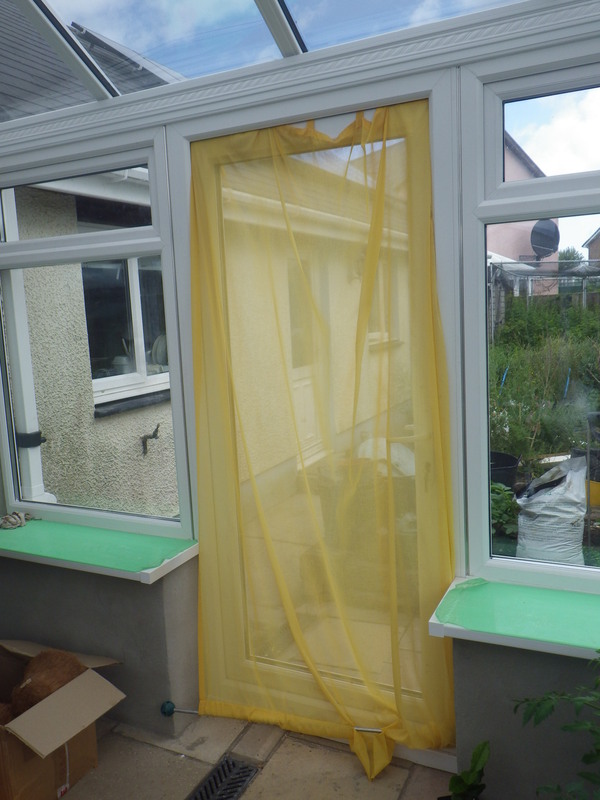 It looks beautifully light and airy, and if you can keep out the insects, it’ll be a safe haven for your baby plants until they’re old enough to brave Nature in the raw! I just wish the door was finished! Fingers, toes and legs crossed for you. Thank you… I’m not holding me breath!! When, I wonder, was a building project ever brought in on time and on budget? The worst thing is waiting for something to happen – you wait and you wait and you wait some more. I find it had to believe that anything will ever happen at such times – all my impatience gathers force and focuses on this one insurmountable problem – the unfinished ……… whatever!! Is this how you feel too? If it is, I understand exactly how you feel! It looks really beautiful. I will hope for an expeditious finish! It’s coming along nicely, but I echo the others: projects, especially when out of our control, seem to take forever! Best of luck. It looks great from here. I’m delighted with your insect screen. Clever you. I, too, hope it is finished soon so you can enjoy it; I have a thought for your lime tree in the meantime: I knew a woman in Victoria (BC) who had a fairly large fig tree that she moved onto the patio in summer and back onto the porch in winter. It sat on a circle of wood (I think it was wood) that had 3 or 4 wheels attached; lovely big sturdy ones that made short work of the bumps and ruts between the patio st ones. You might be able to buy a similar stand or maybe have one made; it would sure save your back . . . Remember Murphy’s law? Well you have to use a bit of reverse psychology with it. I used this trick with my kids till they were old enough to realise that I was pulling the wool over their eyes…the trick is sort of like physics but for people who don’t understand physics. I know you are a clever clogs lecturer and probably DO understand physics but I don’t. I know that what goes up usually comes down (sometimes it lobs on a roof and good luck to it coming down then as I don’t “do” roof climbing…) and that’s about all that good old physics and I have in common aside from the magic of nature and I choose to allow it to stay “magic”. So here’s the thing…”The more you cram into any given space the more likely you are to have to move everything out of this space in a very short space of time”. I think it is akin to the Unseen University. It’s “Majic” pure and simple. Cram the living daylights into that conservatory and every workman this side of the Pecos will turn up on Monday, looking at their watches and saying “look, I HAVE to get this done today!” They will be lining up with their thermoses and tool bags at the ready and you will have tradies that you didn’t even know were coming (and didn’t even know that were needed for the job!) turning up. Try it. It ALWAYS works ;). I think you may be right there… it does seem to be the case! So, with that I mind I am just potting up plants and putting them in there with gay abandon. The plants are happy and I am happy and the workmen will just have to be patient when they finally arrive! !